Human Growth Agent is a revolutionary formula designed to naturally combat the aging process. HGH is a chemical produced in the pituitary gland of the brain. As we get older our body produces less amounts of Human Growth Hormone. Human Growth Agent is designed to help your body naturally increase it�s own levels of HGH. 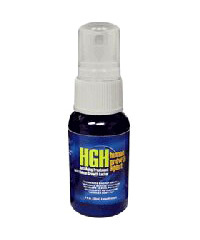 The Human Growth Agent (HGH/HGF) Spray is a proprietary formulation that stimulates the pituitary gland to increase its release of Human Growth Hormone into the bloodstream. The Human Growth Agent Spray includes releasing agents, which are naturally occurring growth hormone peptide molecules. These peptides function as messengers to stimulate hGF and naturally direct the pituitary to achieve maximum GH support. The Human Growth Agent (HGH/HGF) Spray is not a steroid; it is a protein. This protein is naturally produced by the pituitary gland, but we all become deficient in hGH as we age. Human Growth Agent (HGH/HGF) Spray has been developed to provide a physiological dose in line with the body's own natural production and rhythm. This means that Human Growth Agent (HGH/HGF) Spray should be delivered orally in two full sprays under the tongue in the morning, and four full sprays in the evening to provide modest nanogram doses. When taken this way, hGF has been proven to be totally safe, with a record of zero side effects. Order Now!